Peregrine Cottage 42 is a golf home away from home, like no other, perched over the 18th green of the Predator Course and below the Range Lounge and Grill and golf shop at Predator Ridge Resort. Walk in to the cottage and it is evidently all about comfortably accommodating a golfers getaway. Tuck your golf bags in the oversized cubbies to the right of the entry, out of the way but ready to go. Plop your selves in the leather chairs or sofa by the hearth for a simultaneous big screen and patio view. And oh what a view it is from sunrise to sunset overlooking the expansive golf fairways and the horizon beyond. Every component is golf kitschy like lamp bulbs shaped as golf balls, an iron bottle opener and iron stirrers. The ample kitchen is equipped for party preparations. Feather beds and heated bathroom floors await downstairs for a good night’s rest alongside another patio. Lavish is the brand of bath amenities and symbolic of the resort. 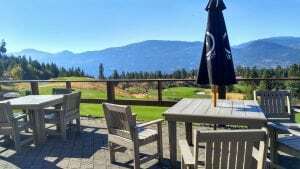 Whether you stay in a private cottage or in the Lodge, expect ethereal landscape views of Super, Natural, British Columbia and two fabulous golf courses. The Ridge Course is a piney woods adventure with severe elevation changes in box canyons among the housing and cottages. You climb and fall within the rugged landscape of wilderness. 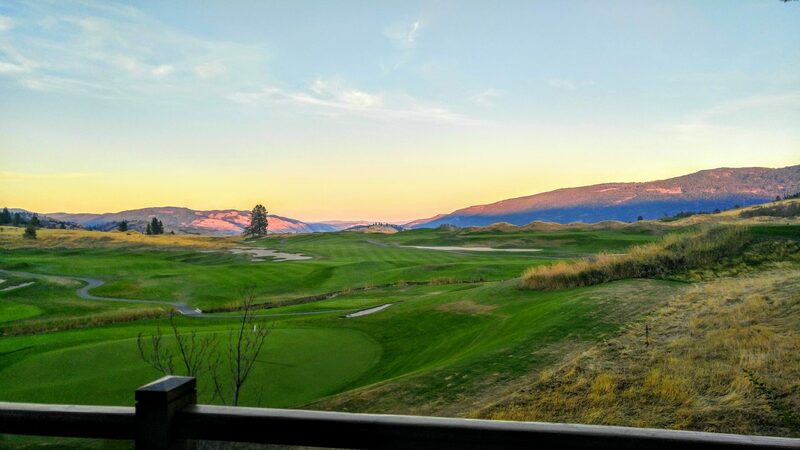 Outcroppings of granite and hilltop tee boxes give way to unobstructed views of beautiful Lake Okanagan. The Doug Carrick design incorporates lakes, streams, and ponds allowing the natural beauty of British Columbia to shine on one of the best courses in Canada. The Predator Course, which hosted the Skins Game, follows the gentle rolling hills with native tall grasses framing the fairways. The greens defy any definition of flat. Predator Ridge has one of the largest practice facilities in Canada. The golf academy boasts one of the best instructions staffs with cushioned seating strategically set like outdoor living rooms to observe lessons or nature. Professionals are former tour players with the right equipment and space to provide private and group lessons. Over 1200 acres deliver exploration opportunities in this vibrant community with 700 homes, biking, hiking trails, golf, and outdoor yoga platforms. Hit the dusty trail to Sparkling Hill Resort. Ask for a day pass at the front desk before you go. Predator Ridge guests are limited to 5 and by the end of the hike through wooded hills it is like finding the emerald City without the witches. You might want to be pampered there. 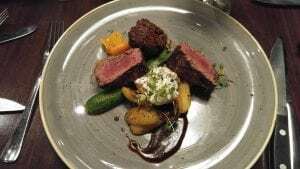 Treat yourself to dinner at the Range back at Predator Ridge where all ingredients are sourced from within a 100-mile range and the steak knives are as substantial as the friendly service. Pair your fresh Angus with the local Burrowing Owl Reserve. 16-acre wine production in Lake Country, BC. While they are famous for their further most northern Merlot and Svigel dry red from Austria with low tanin/acidity but full body color and flavor, they are best known for their German Bacchus (the god of wine). This is a peachy off dry, white varietal. There are 75 different white and 75 different red grapes planted in British Columbia. Arrowleaf is a picnic destination on the lawn where the strawberry patch was. Bring your own food and buy a glass or carafe of wine and enjoy the lake and vineyard views. Since the Zuppigers bought the property years ago, they keep their prices down. They also keep it all in the family employing both sons and two daughters. Dennis O’Rourke is the owner of the newest winery in Lake Country, the deliciously successful The Chase Wines. Dennis shares his philosophy with this toast, “Here’s to finding your true north. To climbing higher, digging deeper, dreaming harder. 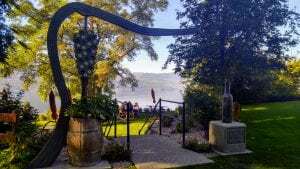 My whole life has been a chase & I wouldn’t have it any other way.” Over 140 wineries, 100 miles of Lake Okanagan and millions of trees equal a great escape in British Columbia. Head northwest for the reopening of the golf courses in April.